Brou ght up in Belfast, Andrew went to the University of St Andrews, Scotland, where he obtained an MA in English Literature. 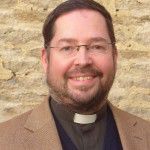 After working for a couple of investment banks in the City of London, he trained for ordination at Wycliffe Hall, Oxford, going on to serve at Holy Trinity, Clapham and then All Saints with Holy Trinity, Wandsworth, whilst also completing a PhD at the London School of Theology. Andrew has been vicar of St Lawrence since 2011. He is married to Kate and they have three children. His sporting interests include following the fluctuating fortunes of the Irish Rugby team! Andrew is assisted and supported in his role by a team of lay readers and retired clergy including Ian Taylor (reader), Gordon Land (reader), David Bainbridge (retired clergy), and Andrew Kirk (retired clergy). Church Wardens Richard Bell and Susan Holmes provide lay leadership within the Church as well as taking responsibility for the smooth operation and maintenance of the facilities and buildings. The Parochial Church Council (PCC) is the constitutional governing body of the church. All on the Electoral Roll may vote to appoint representatives to the PCC. Elections are held at the Annual Parochial Church Meeting with PCC Members appointed for a term of three years. The Director of Music is Rachel Bath, assisted by Organist Anne Margaret Crow and Music Group Director Geoff Holmes. Our parish office is open Tuesday and Thursday between 9-11am. Visit, phone or email Annabel Graves, our parish administrator, with any questions or enquiries. Chris Saunders has served as a full-time youth worker for almost 20 years in far-flung settings such as Aberystwyth, Walsall and Ukraine. He has been in post since March 2009 and loves the variety of every week. His role involves running a number of clubs in schools and communities, engaging young people to consider Christian faith through discussion, bible study groups and 1 to 1 meetings. He also manages a small team of volunteers to support youth via youth services, residential trips, confirmation classes and a whole host more. When he’s not looking for ways to use his two children in his sermon illustrations he enjoys watching (successful) Welsh rugby.